Popcorn Falls is the latest quirky, offbeat production from Joe Hanrahan’s Midnight Company. 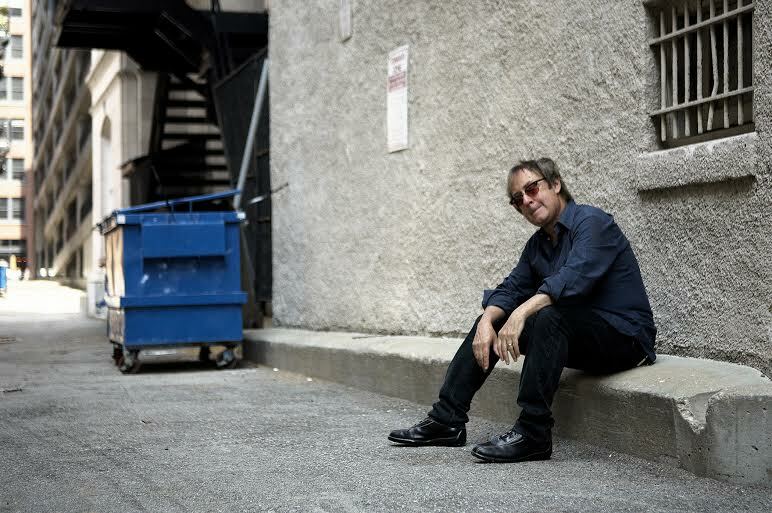 Hanrahan is well-known in St. Louis for his one-man shows, but he has also shared the stage with an array of excellent local performers. This time, Hanrahan and Shane Signorino team up with director Sarah Whitney to stage a hilariously energetic comedy of hopes, dreams, and a host of memorable characters. As is usual for Midnight shows, the staging is minimal, with just a few furniture pieces and props, and that’s all that’s needed here, along with some occasional simple costume changes as the actors change from one character to another. The main figures in the story–set in the declining small town of Popcorn Falls–are new mayor Ted Trundle (Hanrahan), and janitor Joe (Signorino), who find themselves teaming up to save the town from power-hungry county executive Doyle (also Signorino) who aims to tear down Popcorn Falls and build a sewage treatment plant in its place. The ray of hope comes in the form of a financial grant that was awarded for the purpose of financing a theatre group in the town–but there isn’t one, so Mayor Trundle sets out to start one with the aim of putting on a play in order to receive the money and save the town, even after Doyle has given them the seemingly impossible deadline of one week in which to stage this production. Through the course of the show, we meet a varied cast of characters who are assembled to be part of this show, and we learn more about everyone as relationships grow, backstories are revealed, and the characters encounter a series of increasingly difficult obstacles in their efforts to save the town. With this show, the story is fun, but it’s the performers who essentially are the show. Hanrahan and Signorino are both impressive in their energy and presence, bringing a host of characters to life, with Hanrahan’s hapless Trundle and Signorino’s regretful Joe being the anchors. Hanrahan is excellent as usual, and Signorino–who has the most characters to play–is equally impressive, introducing the audience to such different personalities as an imperious librarian, a moody teenage girl, a single mother and aspiring actress, the villainous Doyle, and more. The interplay between these actors and their characters, along with the clever staging to allow for the quick changes–including both performers playing the same character at different times when needed–adds to the comedy and flow of the production. The simple set by Chuck Winning and lights by Tony Anselmo work well to maintain the overall improvised feel of the production, supporting playwright James Hindman’s fast-moving script. This is a simple, somewhat frantic production that gets its energy–and its heart–from its performers. It’s not a long show, but there’s a lot going on, with something of a twist to the ending that’s entirely fitting to the tone of the show. Ultimately, Popcorn Falls is a fun show. It’s FAUSTival part 2! As the latest entry in the extended “festival” featuring works from various local theatre companies, Joe Hanrahan’s Midnight Company is presenting something that’s appropriately Faustian and also reflective of the Midnight Company’s offbeat style. And, also as is usual for this company, the result is well-cast, thoughtful, and fascinating. A revival of a production staged a few years ago, this is a set of two separate one-act pieces, one of which is a “Faust” tale. Both, however, are somewhat metaphysical explorations of concepts and characters. AN APOLOGY… is, essential, just what the title says. Here, Hanrahan plays Dr. John Faustus on the last day of his life on earth, having agreed to sell his soul 20 years earlier to Mephistopheles (David Wassilak), who spends most of the play looming in the background, clad in black velvet and wearing sunglasses and appearing somewhat bored of Faustus’s whole spiel. For Faustus’s part, he’s in regret mode, as well as desperate to hold on to a semblance of privacy as he recounts his efforts to keep some privacy from Mephistopheles, who as part of the agreement has lived as Faustus’s servant for the past 20 years, a constant, annoying presence and reminder of Faustus’s pride and rashness. The casting here is strong, with Wassilak’s presence being suitably menacing by just sitting there most of the time, and Hanrahan’s Faustus being increasingly desperate and grasping for some sort of meaning in his life that’s about to end in moments. Since it’s essentially a long speech with a few brief interruptions by Mephistopheles, it does tend to get rambling and a little hard to follow at times, although Hanrahan’s presence keeps it interesting, as do some clever immersive elements involving Faustus handing out beer and chips to the audience. It’s a particularly philosphical and condensed take on the “Faust” story, with more of an introspective focus as Faust tries to gain the audience’s sympathy. 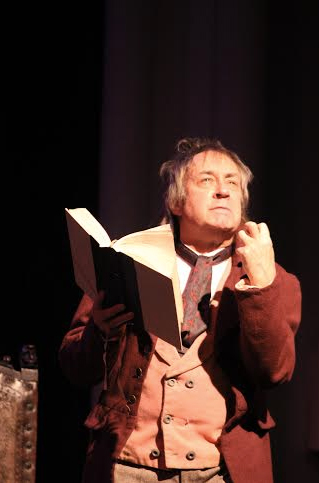 While An Apology… certainly has its moments, especially in terms of its exploration of language and the concept of time and the overall brevity of life, the more entertaining piece of the evening is the more fast-moving, comic seminar-styled The Hunchback Variations. Here, there’s much more of a focus on humor, and the situation is even more bizarre than it is in the first play. Here, the audience is given an imaginary scenario in which composer Ludwig Van Beethoven (Hanrahan) and Victor Hugo’s Hunchback of Notre Dame character, Quasimodo (Wassilak) are seated at a table littered with various offbeat musical instruments (kazoo, tin whistle, etc.) and are giving a lecture recounting their efforts to identify an elusive sound described in a stage direction in Anton Chekhov’s play The Cherry Orchard. The show is essentially a series of vignettes, with similar staging and introduction, as the two, usually led by the more outwardly confident Beethoven, recount their efforts to meet and discover this mysterious sound, as the more sullen, earnest Quasimodo plays various sounds and expresses more of an initially pessimistic outlook about their meetings. This is a fascinating play on many levels–first, it’s hilarious, and the comic timing is impeccable. Second, it’s also kind of sad, as we see the futility and failure of the endeavor as they recount attempt after attempt with the big unasked question lingering in the air–what’s the point? The interplay between these two characters presents their relationship as sometimes companions in futility, sometimes frenemies. It’s an intriguing dynamic to watch, and both players play their parts extremely well, from Hanrahan’s bossy, overconfident Beethoven to Wassilak’s gruff-voiced, weary but still hopeful Quasimodo. Both of these plays are presented in a small backroom at the Monocle bar in the Grove neighborhood, and the intimate setting adds to the mood in both plays. This is a thoughtful, sometimes funny, somtimes profound, always unusual production, showcasing two excellent local actors. It’s a worthwhile theatrical experience. Joe Hanrahan’s Midnight Company usually puts on plays with small casts–often just Hanrahan himself and maybe one other cast member. The company’s latest production, though, is anything but small. Presented at the Missouri History Museum from April 25-29th, Abby Mann’s Judgment at Nuremberg recalls an important time in world history that is essential to remember. With a large cast and excellent staging, this production is one I wish had been given a longer run. The play is a fictionalized version of one of the historic Nuremberg Trials that took place in Germany after World War II. Various defendents involved in different ways in the Nazi regime and the Holocaust were put on trial, with those convicted being sentenced to prison or death. The trial represented in this play involves three German judges (Terry TenBroek as Emil Hahn, Hal Morgan as Frederick Hoffstetter, and Steve Callahan as Ernst Janning), who are charged with playing various roles in supporting the atrocities perpetrated by the Nazi government from the bench, including ordering sterilizations of political dissidents and sending Jewish defendants and others to concentration camps. The cast of 16 is led by Hanrahan as Judge Dan Haywood, a North Carolina jurist who has been brought in to preside over the trial along with Judge Curtis Ives (Jack Corey) and Judge Ken Norris (Charles Heuvelman). The story centers largely on Haywood as he learns about the cases and defendants and other issues involved, such as international and national pressures trying to influence the outcome. Other key players include the passionate American prosecutor Colonel Tad Parker (Chuck Winning) and determined German defense attorney Oscar Rolfe (Cassidy Flynn). There’s also Frau Margarete Bertholt (Rachel Tibbetts), a widow who used to live in the house in which Haywood is staying, and who is soon revealed to have a highly personal connection to the trials. Through the course of the play, issues of personal and corporate responsibility, and national loyalty vs. conscience are raised, among other issues, as the German judges are brought face-to-face with witnesses to their actions and reacting in different ways, from self-justification to acknowledging guilt. This is a somewhat sprawling play, with a lot going on at once and a large cast to keep track of. Structure-wise, it’s reminscent of a lot of other mid-century courtroom dramas, and the play’s program design (graphic design by Dottie Quick) even has a look and style suggestive of this time period. The drama has a lot of players, but the focus is mostly on the courtroom, and the staging here is engaging and energetic, with a cast of excellent performers that bring dimension and energy to their roles. Hanrahan is a good focus figure as Heywood, who functions in many ways as a surrogate for the audience, learning about the events and the people involved, and the history of the city of Nuremberg itself, as the story unfolds. Hanrahan’s Haywood has a kind of easy forthrightness about him that works very well in this role. He is surrounded by an excellent cast as well, including Callahan as the most introspective and remorseful of the defendents, Janning; and also Winning and Flynn as the equally fiery and determined opposing attorneys. There are also excellent turns from Tibbetts as the proud, grieving and somewhat enigmatic Frau Berthtolt, and Micahel B. Perkins, Francesca Ferrari, and Steve Garrett as key witnesses in the trial. The entire ensemble (also including Mark Abels, Jaz Tucker, Charlotte Dougherty, and Alex Fyles) is strong, with memorable performances all around, calling attention to the important and weighty issues brought up in this play–issues that are still relevant today. The production design serves the play well, with Jonah Sheckler’s fairly simple set impressively augmented by Michael B. Perkins’s excellent video projections. There’s also crisp, focused lighting from Bess Moynihan as well as clear sound by Ellie Schwetye and well-suited period specific costumes by Sarah Porter. The overall atmosphere of a 1940’s military trial is well maintained in this fascinating production. This is a show that could have run a little longer. I’m assuming the Missouri History Museum had limited availability, but it’s a shame that such a well-staged, powerful production like this couldn’t have had more performances. A production like this deserves to be seen by a larger audience. The Midnight Company is starting off the New Year with a trip back in time. With their new production of Rick Creese’s one-man play Solemn Mockeries, the Tower Grove Abbey has been turned into a sort of “Wayback Machine”, transporting the audience to 19th Century London, where we are introduced to the colorful William-Henry Ireland (Joe Hanrahan), who recounts his fascinating, alternately comic and tragic life story, focusing on that one time, 30 years earlier in 1795, when he almost got away with forging a full-length Shakespeare play and managed to have the play staged by some of the most prominent theatrical figures of the era in one of the most well-known theaters in London. It’s one of those too-strange-to-believed anecdotes of history that, astoundingly enough, actually did happen, and this production turns that improbable tale into an entertainingly immersive evening of theatre. The setting is very simple, but completely effective. Just a few pieces of furniture and a series of placards announcing Ireland’s appearance (introduced by a silent, sober-faced man in impeccable early 19th Century costume) help set the mood and transport the audience back to an era in which the apologetic but also proud and enterprising Ireland is making a living out of reliving his earlier adventures before the general public. The Tower Grove Abbey, a re-purposed early 20th Century church building with its wooden pews and stained glass windows,is a fitting venue for this event, and Hanrahan, as Ireland, even makes a sly reference to the building in his opening remarks. 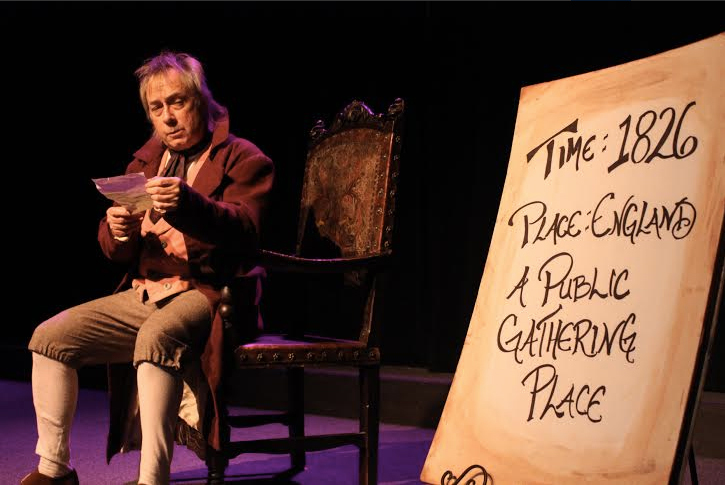 It’s easy to get caught up in the illusion of the 1820’s setting as Ireland tells his story and interacts with the audience, giving impromptu quizzes, asking for opinions and offering whimsical commentary on the events as he portrays them. Hanrahan, looking like he stepped out of the pages of a history book in costume designer Taylor Steward’s well-appointed ensemble, portrays Ireland as an eager-to-please, charming rascal who is at once proud and apologetic about his career as a forger. His accent is a bit uneven in places, but that doesn’t really matter in the long run since his Ireland is such a fascinating character, and his descriptions of his upbringing and the events that led into his acts of fraud are thoroughly compelling to watch. Hanrahan portrays not only Ireland, but also Ireland’s impressions of various character’s in Ireland’s life, from his stern, historical relic-obsessed father, to his opportunistic actor friend, to the Duke of Clarence (the future King William IV) and the various actors involved with the production of Ireland’s faux Shakespearean tragedy, Vortigern. It’s a hilarious comic performance, but also tinged with regret and even tragedy, as Ireland is shown as an ingratiating sort whose greatest wish in life was to please his own implacable father, who ignored and neglected the young Ireland until he suddenly “found” all these documents supposedly written by the Bard. Hanrahan’s Ireland is a mass of contradictions–reveling in his adventures while simultaneously showing regret and a desire to be accepted, full of self-deprecating wit and giddy, gleeful energy as the story of his colossal failure unfolds. The play itself finds a lot of sympathy in Ireland, especially in his upbringing and neglect by his parents, but it also presents him as something of a pathetic figure–a mediocre artist looking for validation, but who was born into a world where celebrity was highly valued and enterprising people could make their own fame if they had the right motivation, and the right gimmick. It actually sounds a lot like today, which is why I think a story like this can be so entertaining for modern audiences. Today’s William-Henry Ireland would probably have his own reality show as opposed to appearing on the lecture circuit, but regardless of how enlightened people may think they are today, there still seem to be engaging frauds like Ireland popping up from time to time looking for attention and, eventually, forgiveness. Ultimately, I was impressed by how vividly the times and places of William Henry Ireland’s life were evoked by this production, with nothing more than the impeccable costumes, simple sets and Hanrahan’s compelling performance to hold the audience’s attention and capture our imaginations. Ireland is a person that many people may not have heard of, and this production introduces us to him and and the events of his life in a thoroughly engaging way. It’s a very amusing and thought-provoking journey through time.